West Elm wanted its new corporate headquarters — located in the historic 1860s Empire Stores building right on the East River in Dumbo, Brooklyn — to be a timeless, sophisticated space with more of an art gallery vibe and less of a trendy office look. VM Architecture and Design carried out that vision by creating a bright and airy environment that celebrates and enhances the brand’s design aesthetic and incorporates custom artistic elements created by West Elm’s world design partners and local Brooklyn-based artists. Light and dark planes give the eye a break from the heavy timber and brick, while planned light corridors ensure every window and exterior penetration is visible throughout the space. Image by Garrett Rowland. The space boasts a wide range of options, including a combination of open plan benching solutions, private offices, teaming zones, etc. All six of the West Elm Workspace collections are installed here, including Mid-Century, where our Furniture Design team sits; Beam, where our Sourcing team is stationed; Truss, where our merchandising team sits; Modern, where our inventory team is located; Spindle, where the global and store operations team sits; and Industrial, where Brand marketing and PR sit. The executive offices showcase the Mid-Century collection in the walnut finish. According to VMAD, the collaboration among “VMAD, West Elm, Brooklyn-based and international artists created a truly remarkable environment.” Image courtesy of Garrett Rowland. Huddle spaces, large and small conference rooms, product design team meeting rooms, design library, board room and an executive conference room. Design Library, Pagination space for media and graphic layouts, Color Swatch Library, Lighting Workroom, Textiles workroom, Decorative Accessories work room and a Mock Store. Located on the Historic Brooklyn Waterfront, near water taxis and the F and AC lines of MTA. West Elm’s new headquarters contain a number of break areas. Image courtesy of Garrett Rowland. The Brand President had some very specific goals for the aesthetic and functionality of the space. We had many working meetings with senior staff to iron out the best programming for the growing departments. We recognized the opportunity within the contract space to introduce product with a more residential feel, which is where West Elm Workspace was born. We wanted to design a space using the Workspace line that provided employees with spaces where they could retreat and concentrate or meet with colleagues. Yes, detailed deep-dive programming interviews were held with all VP and director level staff. A walk through of existing spaces and studies of work flow and work product were also conducted. Directors worked with their teams to serve as the conduit to the design team. The historic nature of the site and the adaptive reuse of the project and the building required all types of creative problem solving. Customized mechanical solutions, daylighting, and LEED certification all factored into the project. With the Brooklyn headquarters, West Elm transitioned to an open plan. Image courtesy of Garrett Rowland. Wellness is an ongoing focus and priority for all WSI Inc. Brands. 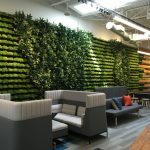 Initiatives include mother’s rooms, classes, healthy snack options, filtered water, fresh fruit and quiet zones, as well as an overall residential design aesthetic in the office that enhances overall employee wellbeing. This building is a 150-year-old wood and timber building that lay abandoned with no electricity and no windows, only metal shutters. Therefore, construction was a large, and unusual undertaking. It had to be completely modernized and protected from the floods of storms like Hurricane Sandy, that flooded the building with six feet of water. An Aqua fence system has been designed to create a protective damn around the entire structure in case of future flooding. All of the West Elm Workspace collections are represented within the office. In addition, the space features the wide range of eye-catching Workspace ancillary offerings, task seating, guest seating, lighting, conference and occasional tables, accessories, as well as contract textiles by our partner Designtex and exclusive flooring designs from our collaboration with Interface. Inscape Acme wall systems where used for the architectural walls. VMAD created a space that reflected West Elm’s desire to project more of an art gallery vibe, less of an office feel. Image courtesy of Garrett Rowland. West Elm signing in lobby: Choice Community Consciousness. The Brand Ethos marquee was designed and installed at the top of the grand stair. Choice: Our products and solutions offer a variety of aesthetic and functional options to help our customers – and employees – express their personal style. Community: Inspiring and innovative common spaces, from cross-functional staircases, to coffee and revitalizing bars, along with indoor and outdoor meeting areas that promote conversation, collaboration and creativity; And beyond our offices, building communities through the empowerment of our store shopkeepers, our LOCAL program, artisans and customers by being champions of the way our customers live. Consciousness: Building a sense of place and purpose by including recycled materials from the original Empire Stores structure and nearly 170 handcrafted works commissioned from artisan partners around the globe. On the West Elm brand level, becoming a model for environmentally responsible production – like offering only organic cotton bedding, FSC-certified wood furniture and eliminating toxic techniques from our manufacturing. Wellbeing was a major tenet of the design of West Elm’s new space, hence this kitchen table/coffee bar. Image courtesy of Garrett Rowland. There are quite a few unique features, both in design and functionality throughout the space. The entire space is an expression of West Elm Workspace’s work with social research and design consultants to sharpen its understanding of emerging workplace concepts. The company has identified three key values that inform its designs as well as the design of their offices: wellbeing, residential inspiration and choice. West Elm Workspace offers individuals and organizations choice and control over how they shape and engage with their work environments. Our suite of products provides cross-functional teams and individual contributors with spaces that support a variety of work styles. We consider choice to be reflective of the flexibility employees have in a work environment and pride ourselves in putting the employee in control of where and how they work, from offering individualized solutions to retreat and concentrate to designing products that foster collaboration and congregation. In addition, West Elm has excelled for nearly 15 years at understanding its residential customers and with West Elm Workspace it offers its distinct residential sensibility thought its contract grade products and solutions. Our residential expertise and consumer insight uniquely positions us to help humanize the workplace. 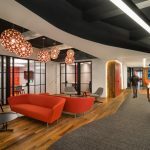 This space features elements that impact the employees’ overall experience at work by using light, material elements, and texture to add warmth and create inviting atmospheres that are uncharacteristic of today’s offices. A few examples: The large atrium lobby, grand stair and balconies create a central town hall space for all hands meetings. The “Bridge” and Design Library offer sweeping, mesmerizing views of the Hudson River, Manhattan and the Brooklyn, and Manhattan Bridge. Numerous comfortable lounge and breakout spaces offer options for retreat and individual work. West Elm teamed up with the global artisan partners, mainly from India, the Philippines and Haiti, responsible for creating many of their handcrafted products to make more than 170 one-of-a-kind pieces of art on exhibit throughout the office. VMAD coordinated with multiple artists in Brooklyn and around the world for the original artwork that adorns West Elm’s new corporate headquarters. Image courtesy of Garrett Rowland. West Elm Workspace is designed to impact the total wellbeing of today’s office employee. This means creating environments that benefit the worker’s physical, emotional and psychological wellbeing. By drawing from our social workplace research, we have created products and solutions that enhance the human and environmental experience by allowing employees to connect with the people and objects in their surroundings, paying attention to the design, form, function and materials. A few examples: A long plant wall brings nature indoors, the Bridge boasts expansive views of the river and this along with, an installation of the Conover Plinth Sectional and the James Harrison Settee in various location, act as comfortable retreat spaces. The coffee bar acts as casual meeting place or “kitchen table” for employees. All standard, corporate AV Products are installed in the space. For the conference rooms, any presentation is through a wireless link. Only power and low voltage data cables are provided within the room. The migration to open plan: The larger footprint meant teams were further apart and the energy of the spaces changed. Preserving the views of the East River and the Manhattan skyline was important in the design of West Elm’s new offices. Image courtesy of Garrett Rowland.